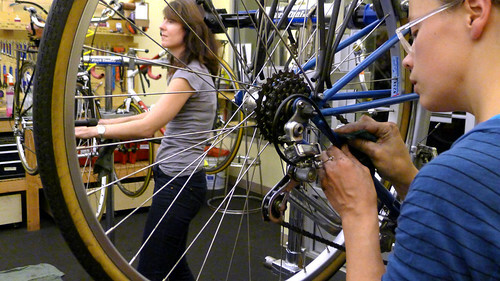 Home » Blog » Now launching Women/Trans Bike Maintenance Class! 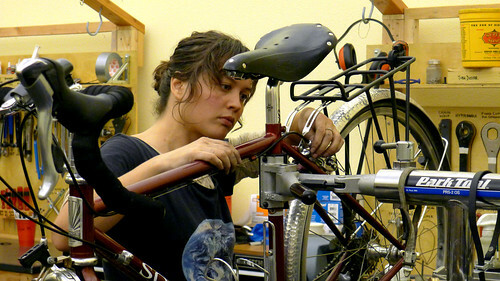 Now launching Women/Trans Bike Maintenance Class! When folks find out where I work, one of the first things they usually say is, “The Community Cycling Center, that place is the coolest!” And they are correct. One of the next things they usually say is, “One of these days I’d really like to learn how to fix my own bike.” I’m excited to share the news that we are piloting a class this fall! We are in the midst of bringing back our adult bike maintenance classes to create a space where people can empower themselves to work on their own bike with the support and guidance of our awesome mechanics. To pilot this program we are offering Basic Maintenance for Women/Trans People this November. Whether it’s fixing a flat, adjusting your brakes and derailleur, or getting down with some bearing systems, this class is a great way to empower yourself with bike maintenance skills in a safe and friendly environment. You’ll gain a more comprehensive understanding of the systems of the bike overall while also focusing on projects that will help your bike ride better. During our class, you will experience a lot of hands-on learning while working on your very own bicycle, ensuring that you will ride away having a greater understanding of how your bike works. The pilot class will benefit from the guidance of two of our awesome mechanics: Andrea Chiotti and Jackie Mautner. In addition to doing mechanic work at the Cycling Center, Andrea worked at the Free Ride Bicycle Project in Pittsburgh, PA and assists with Women/Trans wrench nights at Bike Farm. Jackie is not only an awesome Bike Polo player, but has also taught a Women/Trans Bike Repair Class for Time’s Up in New York City. Both Andrea and Jackie are committed to a teaching style that gives class participants the space to experiment, explore, and get their hands dirty! The pilot class will be covered by two 5-hour workshops on November 14th and 21st and will be hosted at our shop located at 1700 NE Alberta St. The full price of the class is $150, but reduced rates are available for Oregon Trail Cardholders. To enroll online, access the registration form here. For questions about the class content, registering, or future classes, please contact Jake Schorr at Jake@communitycyclingcenter.orgor 503-288-8864 ex 333. Not a woman/transgender person but looking for bike maintenance classes? Good news! We hope to offer more classes this winter and spring. If you have ideas for future classes, please send us your input so that we can include it as we plan additional offerings. We can’t wait for you to learn how to fix your bike!